People are asking, Paul, what is the link between the RMB Yuan and the precious Yellow metal? 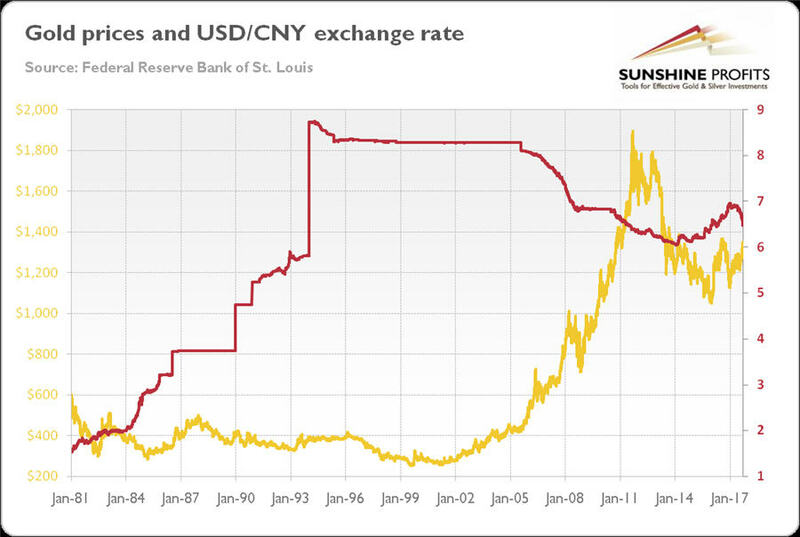 Chart 1: The USD/CNY exchange rate (red line, right axis) and the price of Gold (yellow line, left axis, London P.M. Fix) from January 1981 to September 2017. As you can see in the chart above, there is no clear long-term relationship between the precious Yellow metal and the USD/CNY exchange rate. It is not surprising, as the exchange rate of RMB Yuan was set not by market forces but by the authorities for most of its history. In the beginning, until the 1970’s, when the Chinese government started to liberalize the command economy, RMB Yuan was overvalued to support imports and reduce the country’s dependence on imported manufactured goods. However, it was devalued to 8.74 in Y 1994 to support exports. The Chinese government maintained the peg to USD at about 8.3 until Y 2005. Although the peg was then lifted, it was reintroduced in Y 2008 when the financial crisis happened. It was maintained until Y 2010, when China returned to the managed floating rate system. So, let us analyze the link between Gold and RMB Yuan since then. 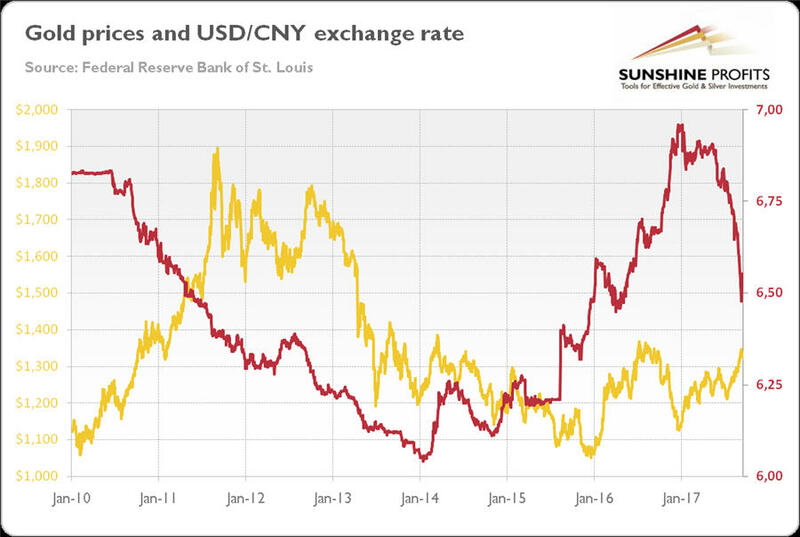 Chart 2: The USD/CNY exchange rate (red line, right axis) and the price of Gold (yellow line, left axis, London P.M. Fix) from January 2010 to September 2017. The chart above also does not show a clear correlation between these two assets. The yuan appreciated since the removal of the peg to USD in June 2010 until Y 2014. In that time the price of GGold reached its multi-year high and then collapsed. In Y’s 2014-2017, the RMB systematically depreciated against USD, but the precious Yellow metal was generally in a sideways trend. In Y 2017, the USD/CNY exchange rate plunged, which helped the Gold prices rally. 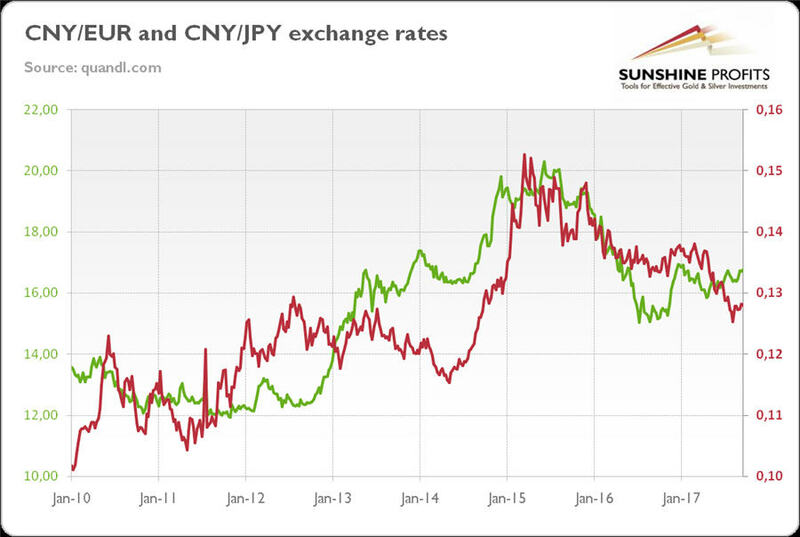 However, the decline in the exchange rate was caused by the weakness in USD rather than by internal strength in RMB Yuan. As you can see in the chart below, in Y 2017, the CNY did not appreciated against JPY and actually depreciated against the EUR. Chart 3: CNY/EUR exchange rate (red line, right axis, weekly averages) and CNY/JPY exchange rate (green line, left axis, weekly averages) from January 2010 to September 2017. The international importance of the Chinese currency has been rising recently. In January 2015, the yuan became the fifth most widely traded currency in the world, while in October 2016, it was added to the special drawing rights basket used by the IMF. Moreover, China, the world’s biggest Crude Oil importer, has recently created a Crude Oil futures contract which is priced in RMB Yuan and convertible into gold. If such an instrument is adopted by oil exporters, the value of gold expressed in USD would likely rise, as the wide adoption of such a contract would lower the petro-demand for the Buck. However, RMB Yuan-denominated commodity contracts have been unsuccessful so far, so investors should not count on RMB Yuan dethroning USD anytime soon. Sharp changes in the exchange rate of the RMB can send shock waves through financial markets, having an effect on old. As a reminder, in Summer of Y 2015 China devalued its RMB Yuan, which pushed global equities lower. Hence, a devaluation of the RMB would imply an appreciation of USD which does not sound good for the Gold market. However, the revaluation of the RMB could also significantly affect the markets. This is because China purchases a lot of US Treasuries in order to recycle its huge USD surpluses (it buys foreign currencies to maintain cheap RMB Yuan, which stimulates exports). Hence, sudden sales of the PBOC’s forex reserves would increase the US yields. Higher interest rates are usually negative Gold prices, but the safe-haven demand for the precious Yellow metal could then increase. Despite the rising importance of the RMB (renminbi) in the world, its link with gold remains rather weak. Although perma bulls believe that the U.S. dollar will collapse soon and the gold-backed yuan will replace it as the world’s reserve currency, gold investors should not investing in the yellow metal, betting on this scenario, as yuan is not as freely floating, liquid and transparent as USD.